FuHang focuses on creating knives that are ready for all situations. Whether you are a knife collector, survivalist or a first responder, you can trust that FuHang knife will be the tool you can rely on in any situation. We accept 100% refund or return if there's quality problem for our product. If you are not completely satisfied with your purchase, please contact us before leaving neutral or negative feedback. We are committed to your satisfaction. Please feel free to contact us at any time for any questions you have. 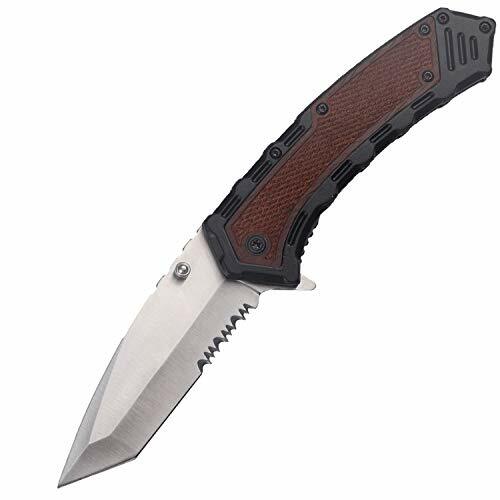 Dimension Size: 8.2 inch (21 cm) overall length with a blade length of 3.4 inches (8.6 cm) and a weight of 7.1 ounces. Razor Sharp: 3Cr13MoV blade with serrated edge, perfect for slicing, sawing, and personal protection. Survive the Harsh Outdoors: with a 3.4 inch blade fortified with alumin alloy to prevent corrosion in severe conditions. Great Gift: Perfect for handymen, first responders, SOG enthusiasts and survivalist. Lifetime Guarantee: Lifetime satisfaction guaranteed or your money back, no questions asked. If you have any questions about this product by FuHang, contact us by completing and submitting the form below. If you are looking for a specif part number, please include it with your message.